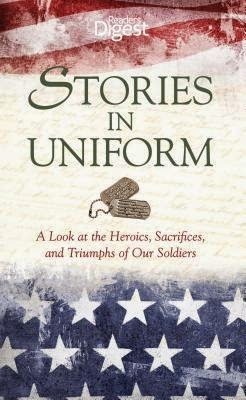 Stories in Uniform is a chronological retrospective of the best military pieces Reader's Digest has run; pieces that will make you weep, make your heart sing, inspire you, enrage you, and make you laugh. Beginning in World War I and continuing though to the war in Iraq, readers will follow soldiers into the trenches, peer in on emergency surgery taking place in the depths of the ocean, watch heroes carry the bodies of fallen brethren, trail Eisenhower for the three days leading up to D-Day, and be inspired as men and women rise above and beyond normal human limits to preserve our rights and save their friends. This is such a great book filled with tons of different touching stories about those hero's in our life who sacrifice themselves for their country. I was very touched by each story when reading this book. There's so much that goes on to soldiers who serve our country while they're in the line of duty and when or if they come back they're still left with the memories of the events that occurred. Not only am I'm grateful for every single man and woman who has and are still til this day putting their lives on the line, but I'm also grateful for those in this book that have shared their stories for the world to read. I had goosebumps, smiled, cried and so many other emotions while reading their stories. I can't even imagine going through what so many soldiers have to go through every single day. I only pray that they all come back and make it home to their families safely. This is definitely a book I would recommend for just about anyone. Disclosure: All opinions are my own. I received Stories in Uniform at no cost for the purpose of this review. No other compensation was received.